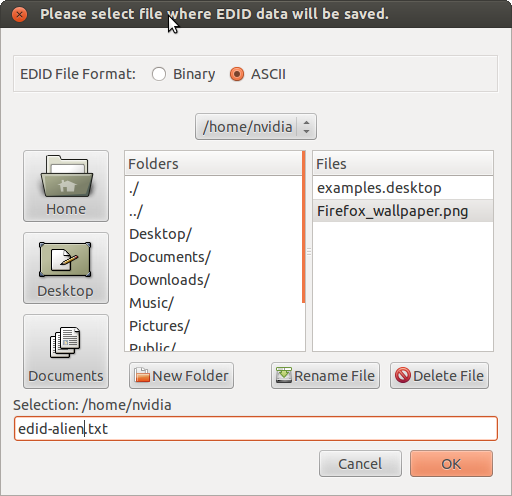 Select display that you wish to "Acquire EDID"
Loading the EDID from file is specified in the xorg.conf file. 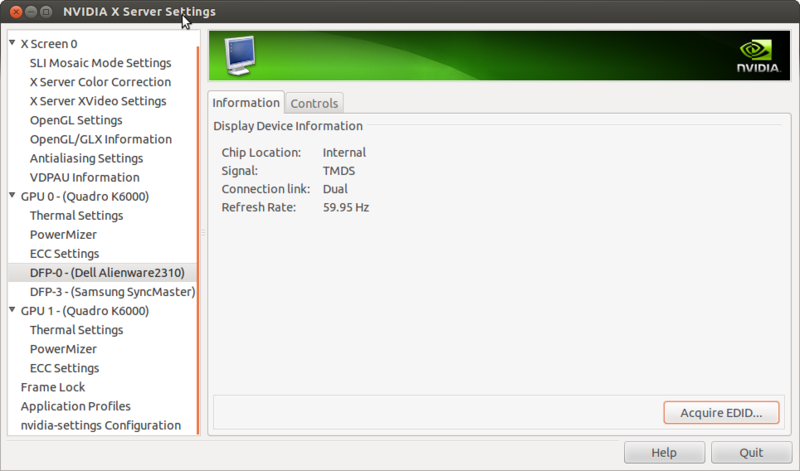 §  This will write the "CustomEDID" option to the xorg.conf file. Option         "MetaModes" "1680x1050 +0+0, 1680x1050 +1680+0, 1680x1050 +3360+0"
Restart X and check that the EDID has been set correctly. [   108.085] (**) NVIDIA(0): Option "nvidiaXineramaInfo" "False"
[   108.085] (**) NVIDIA(0): Option "SLI" "Mosaic"
[   108.085] (**) NVIDIA(0): NVIDIA SLI Mosaic mode selected. [   108.085] (**) NVIDIA(0): Option "CustomEDID" "GPU-0.DFP-3:/home/nvidia/edid-alien.txt"
[   108.085] (**) NVIDIA(0): Option "MetaModes" "1680x1050 +0+0, 1680x1050 +1680+0, 1680x1050 +3360+0"
[   110.040] (II) NVIDIA(GPU-0): NVIDIA SLI enabled. [   110.179] (II) NVIDIA(0):     stereo. [   110.198] (II) NVIDIA(0):     stereo.